The first thing many of us want to buy for our new puppy is a bed. 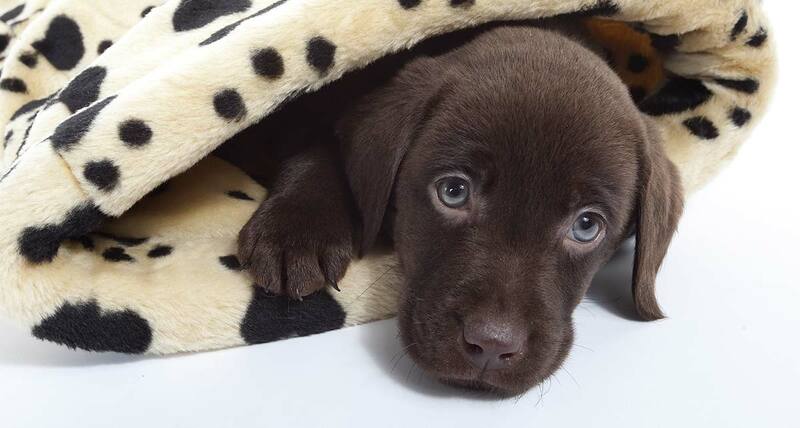 There is so much choice when it comes to Labrador puppy beds. Round ones, square ones, squashy ones. Beds lined with faux fur, tartans and checks. 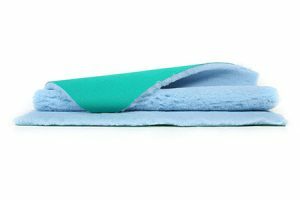 Washable, spongeable, hose able, even waterproof beds. Beds with legs, beds with sides, orthopaedic beds, baskets and blankets to put in them. Perhaps the very first thing we need to consider, is what puppies do to beds. Puppies generally, are not kind to their beds. They chew them, have ‘accidents’ on them, pull out any stuffing, and rip up the covers. “What about chew proof beds?” you say. 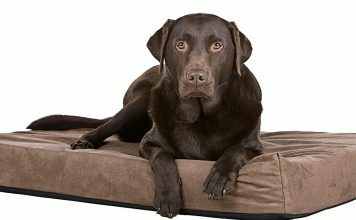 Unfortunately there is no such thing as a completely ‘chew proof’ bed, as the only thing a healthy medium sized adult dog can’t chew, is made from material you would not want to sleep on. There are some pretty tough fabric beds that will resist modest attempts at chewing. 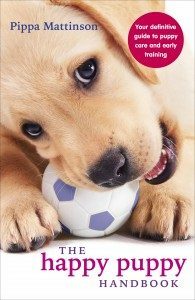 But nothing will stop a really determined puppy from working his teeth through the strongest bed, given the time, and the inclination. Before you dash to your keyboard, to protest that you know of a puppy whose bed was not consigned to the dustbin within a week, I should say, that not all puppies destroy their beds. Some puppies curl up in a tousled heap of puppy gorgeousness surrounded by lovely cushions and soft toys, and never chew a single one. 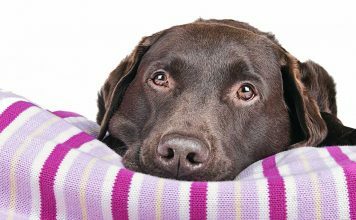 Giving your puppy plenty of chew toys may help reduce the risk of your puppy devouring his bed, but most puppies still chew their beds, even if given all the right toys. Some puppies unfortunately rip up and actually swallow any kind of bedding. Many times, things that puppies swallow just pass through. But swallowing bedding can cause problems for the puppy if the swallowed pieces get trapped in his digestive system. If your puppy is chewing up his bedding, you need to watch him carefully. 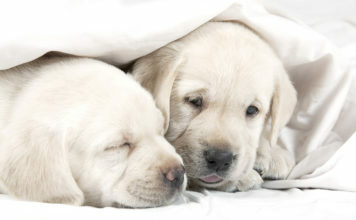 Most puppies will spit the bits out, but if your puppy swallows them, you need to take the bedding away. If you think he has swallowed quite a lot, phone your vet who will advise you on symptoms to watch out for. 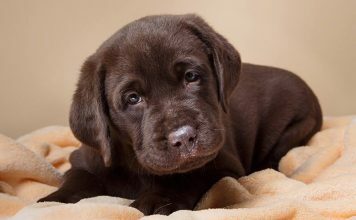 Contact your vet urgently if your puppy stops eating, seems unwell, or is unable to empty his bowels. If you have one of the few puppies that eats any kind of bedding then you’ll need to improvise a safe sleeping surface, with tough matting or wood that fits tightly in the crate so he cannot get at the edges. Happily these puppies are quite rare too. 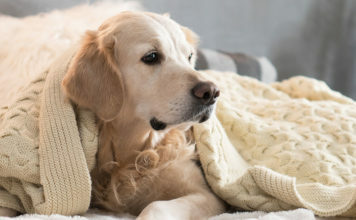 The fact that your puppy will probably damage his first bed, is something you need to consider before you head off to your local pet supermarket, or start browsing the online stores. The less edges the bedding has, the less likely the puppy is to rip it up. And some bedding seems to be less appealing to the puppy to chew. Although these often look the most tempting, on the whole it is best to avoid deeply and loosely padded cushions with lots of stuffing. Or at least to save them for parts of the house where the puppy will be closely supervised. And probably sensible to wait for a few months before purchasing anything too expensive for your puppy to sleep on. Especially when it comes to crate bedding that he is left alone with during the night. There are four types of bedding to consider for your new puppy. 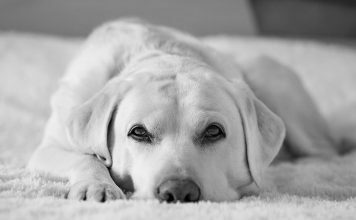 If your puppy doesn’t rip up his bed, or for places where he is supervised, we recommend a fleecy lined bed with raised sides. Like this one from the ASPCA . 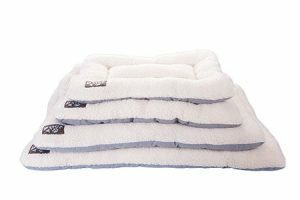 We also like the cozy ‘donut’ style beds for puppies. Puppies can really snuggle into these. 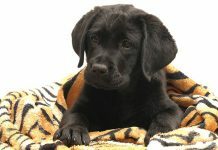 You can make your own perfectly serviceable puppy bedding from old towels or blankets, cut or fold to fit your crate. 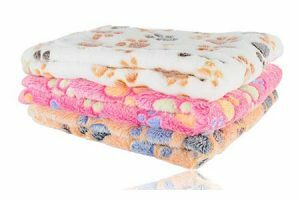 Or you can buy pretty puppy blankets which are soft and easy to clean. If you are using old blankets, it is a good idea to cut these into sections that will fit easily in the washing machine. Old baby blankets are ideal as they are always machine washable and usually tumble dry too. If you don’t have any old blankets, you can often get them very cheaply from charity shops. The downside of blankets and towels is that many puppies love to chew them, they tend to trap hair, and you’ll need several layers to make a nice cosy surface. 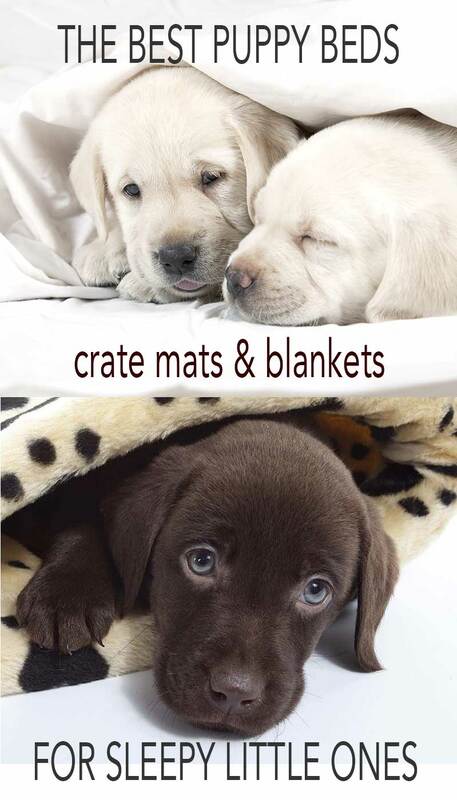 Puppy crate mats are specifically designed to fit standard crate sizes. 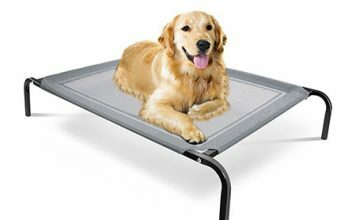 They are reasonably priced and because they fit the crate without stray edges flapping about, they may be less likely to be chewed than blankets or cushions. Crate mats are not too bulky, and fit in the washing machine. And don’t have a huge amount of stuffing, which may be some comfort is your puppy decides to disassemble his. You will need two mats, so that you have a replacement ready when one is being washed. Veterinary bedding makes great puppy bedding. It is made from an artificial fleece fabric. It is washable, tumble dry able, and very hard wearing. It is the ultimate puppy sleeping surface. And most puppies don’t seem to chew it with any enthusiasm. It may not look quite as cosy as that snuggly cushion, but it will still be soft and snuggly, long after a cushion has lost its ‘bounce’. 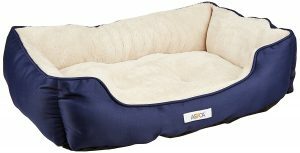 Vet bed has a stiffish backing, and very large pieces can be awkward to fit in the washing machine. But you can overlap two smaller pieces in a larger crate, and it softens with repeated washing. 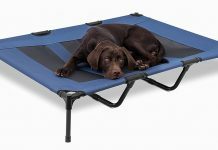 You can buy vet bed on a roll, or ready cut to fit your crate or basket. 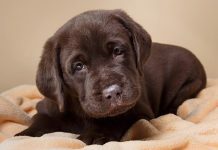 Many puppies will have been whelped and raised on vet bed, so your puppy will feel nicely at home. All my puppies and older dogs sleep on vet bed. I think it is a marvellous invention, and I wouldn’t be without it. Check out our ‘dog bedding ideas’ page for more suggestions and information. And share your tips with our readers. 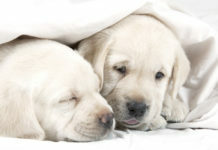 What is your favourite puppy bedding? Let us know in the comments below, or join the forum to chat about your new puppy. Molly had so many accidents that I was washing her bedding every day and I ran out of old towels, and just put newspaper down in the end till her bed had dried. She had a go at chewing her beds as well. 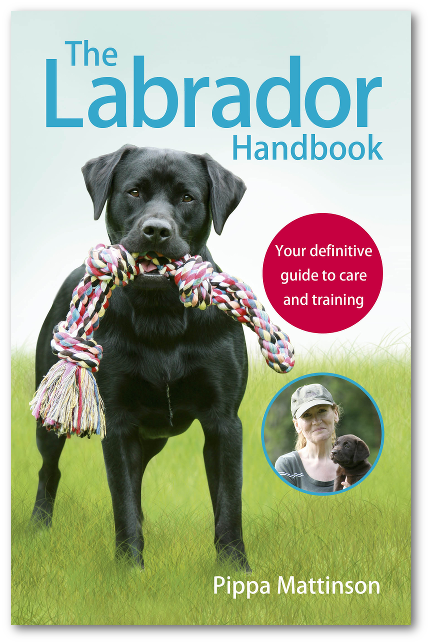 When she was at the breeders she was sleeping on a plain floor in her kennel with her other litter mates at the bottom of the garden and she was a credited breeder by the Kennel Club too. Didn’t do her any harm. we got him a new one a cheaper one this one was destroyed by both dogs playing tug of war we then got another cheap one which is now under the house where the cats sleep (we live on a farm) he has not had one bed since and he is now 3 years old he never really used any of his beds he has really slept with us in the bed since we got him at 10 weeks and still climbs under the blankets every night. Our black lab mix just turned 1 year old this month (Feb.) and to this day cannot have any sort of bedding in his crate with him without pulling all the stuffing out within minutes. We’ve tried putting him in there with all his toys and once he demolishes the toys (our vet says that hard plastic is bad for his teeth and the soft rubber toys just don’t last) he starts on his bed. He does okay with his bed outside of his crate though. I’m hoping he’ll eventually grow out of this because I know it can’t be comfy but to ensure that he doesn’t end up with an obstruction I don’t want to take the risk. Is there anything more I can do other than just be patient? We finally bought our Lab a beautiful fabric padded bed shaped like a regular rectangular dog bed with four sides and a “doorway” on one side where the side is lower (although he climbs in from any side, but he does like to sleep with his head sometimes hanging out of the “doorway”). Up till now he’s had a soft mat for sleeping on downstairs during the day and a big cushion (that he never really used, I think it was too stiff and he couldn’t stay on it comfortably) for upstairs night-time sleeping. And various blankets that he could dig into a ball for his head (yes, he loves a soft cushion for his head! Admittedly I put one of my down pillows on the floor every night so that he could bury his head in it when he went to sleep — he loved that!). What I think he likes about his new bed are: the sides where he can curl up close to the sides and get nice and cosy; it’s big enough so that he can completely stretch out on his side with room to spare but have the sides there to keep it cosy; and he can also rest his head on one of the sides if he so wishes, or when he lies on his back he can hang his legs over the side! It was an expensive purchase and I’m glad he isn’t a chewer. Our lab retriever a Ruby has slept in a banana box with two lovely soft polar fleece blankets and a slim nylon cornered foam mattress since she came home to us at 7 weeks. She has slept all night since day one. (Newspapers beside her for night time releif). We have recently had to join two banana boxes together because she had chewed the first one and had need more space as she has grown ( now 15 weeks). We will purchase a proper bed once she is grown and no longer chewing but it shows that you don’t need to spend lots of money for your puppy to be comfortable. Our EL Winston has destroyed all beds we have given him except two. The one in his daytime crate is a K9Ballistic crate mat and he has had it for over a month so far. The one he sleeps on in oue bedroom at night is a LLBean bed and he has had that for a long time and has not destroyed it either.